I don’t know about you but I have never been one to need an excuse to eat cake! This week – 16 – 22 September 2013 – is National Cupcake Week and I decided to see if I could come up with a cupcake with a twist to mark the occasion. I found a recipe in the local paper and added a few things to it – I think it turned out quite well, maybe you will enjoy it too. 1 tsp vanilla extract or vanilla paste. I like the paste but it’s up to your own preference which you choose. * First thing’s first: preheat your oven to 180°C / 350°F / Gas mark 4. * Place the butter and sugar in a large mixing bowl. Beat them together with an electric whisk if you have one or a wooden spoon until the mixture is pale and fluffy. A few minutes on a low speed should do the trick. * Gradually add the eggs, one at a time and beat well until combined. Add the vanilla extract or paste at this point and combine. * Taking a large metal spoon fold in your flour and baking powder. Be careful not to over fold the mixture as this will let the air out and make your cupcakes fall a bit flat. Just combine until no traces of flour remain. * Divide the mixture in two and put half in another bowl. In one bowl add your raspberry pieces and in the other your butterscotch. Add as much for as little as you like. I like the flavours to come through quite strong so if you like this I’d say about 1.5 tbsp of both. * Next sit your ice cream cups on a baking tray and fill 2/3 of each one with your mixture. * Bake for about 12-15 minutes until they have risen and bounce back when you press your finger on them. If you are still not sure they are ready put a knife in the middle of one of them and pull it back out. If it comes out clean they are ready. Otherwise you can leave them for another minute or so. 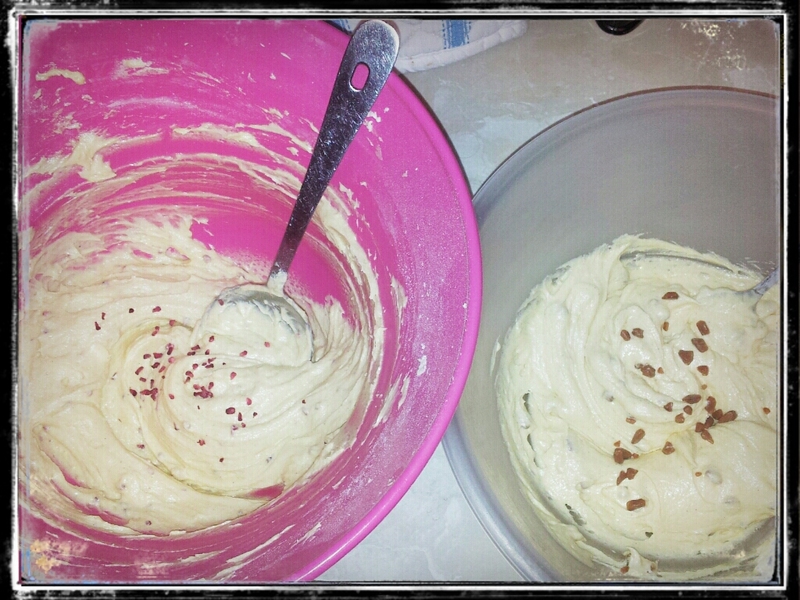 * While your buns are in the oven make a start on your buttercream icing. First of all you need to beat your butter until it is soft, preferably with an electric whisk… unless you want to work on your muscles in which case use a wooden spoon. I’m too lazy for that and opt for the whisk every time! * Next, add half of the icing sugar and beat until smooth. Gradually add the remainder of the icing sugar and continue to beat. Add the milk if you feel the mixture needs it to loosen a bit. Finally add the vanilla extract and keep beating until everything has been combined. * When your cone cakes are ready set them on to a cooling rack or plate and allow them to cool down for at least 10 -15 minutes. * Once cool, divide your raspberry and butterscotch cone cakes. I started with my raspberry ones. If like mine, your cakes have risen over the top of the cone cup take a sharp knife and cut the tops off. Take your apple corer and core out part of your first cake. In the hollow you have made spoon a tsp of raspberry jam. Then carefully press the piece of cake you just cored out back in. Repeat with the rest of your raspberry cakes. It’s the same process for the butterscotch ones, just substitute the jam for your butterscotch sauce. * Next it is time to ice your cakes! Again split the mixture between 2 bowls. I find this bit really messy so try and roll your piping bag down to start off with as it stops the icing sticking to the top and sides. I poured in some raspberry syrup before filling the bag with one of the bowls of icing. You need to be quite quick here or it all starts to skoosh out the nozzle before you are ready for it! Once your piping bag is full twist the bag a few times to seal it in and pipe your cakes. You should get a raspberry swirl effect with your icing. Once you’ve iced those just wash out the bag and nozzle and repeat with the butterscotch sauce and remainder of icing mixture for the rest of your cakes. * To finish pop the kettle on and decorate your cakes with whatever you like! 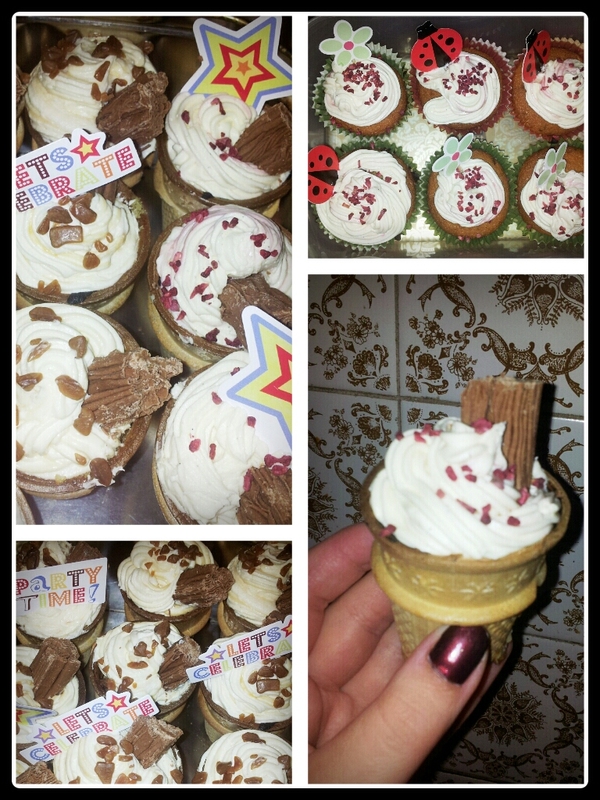 I went for some butterscotch and raspberry pieces and of course some flakes! As with all cupcakes, these taste even better shared so call your friends and family round for a cuppa and a catch up and enjoy the fruits of your labours. These will keep for a good 3-4 days. Enjoy!